In ancient times, a warrior fought for their King who was ordained by God, in the West by the Divine Right of Kings and in the East by the Mandate of Heaven. In some cases they were thought to be divine themselves. As it were the case with the Hwarang Knights of Silla, the origin of Hwa Rang Do® (The Way of the Flowering Knights) today. They served their King with unquestionable loyalty (Sa kun e chung) and the noblest path was to die in the service of the King (Im jun moo teah), which in turn was fulfilling God’s will or the will of Heaven. It has always been throughout history that warriors did not fight to glorify themselves, but for the glory of God, of Heaven. However, when one who did pursue self-glory and power, they were looked upon as evil and unrighteous. Fighting and killing for money was not honorable and fighting for entertainment was forced upon slaves who fought for their freedom. Then why in the modern world, where we pride ourselves in our advances in civilization, in technology, in culture, in morality, through higher intellect and consciousness, furthering ourselves from the need of God as we profess to be gods; where we have rid ourselves of Kings and in it’s place with ordinary ungodly rulers, why should we continue to fight and kill, to hurt and maim each other as though we were slaves? The answer is in plain sight, but often hard to accept as we fabricate grand causes and delusions to justify our choices? We have replaced God with money and money is our new god. We have always been slaves, and in the past by opposing Kings; today we are slaves to money and to the popular culture who thirsts for violence and big companies who profit from them. The question is who and more importantly who do you want your master to be? The True Way of the Warrior is not for sport, but to fight for a cause, to die in service, to sacrifice oneself for others. It is not for fame or fortune, but to defend the righteous and protect the weak. It is not to prove that you are the best and that you are better than others, but how you can serve to better humanity. And, even if you wanted to do that, surely you can do it in other ways than to beat another person senseless, knocking them out in a pool of their own blood. No the Warrior’s Path is a heroic journey with the lingering question; can I die to save another’s life when the time comes? The knowledge of fighting, martial arts is like carrying a weapon and must only be used to defend and should not be used in contests of ego and pride. 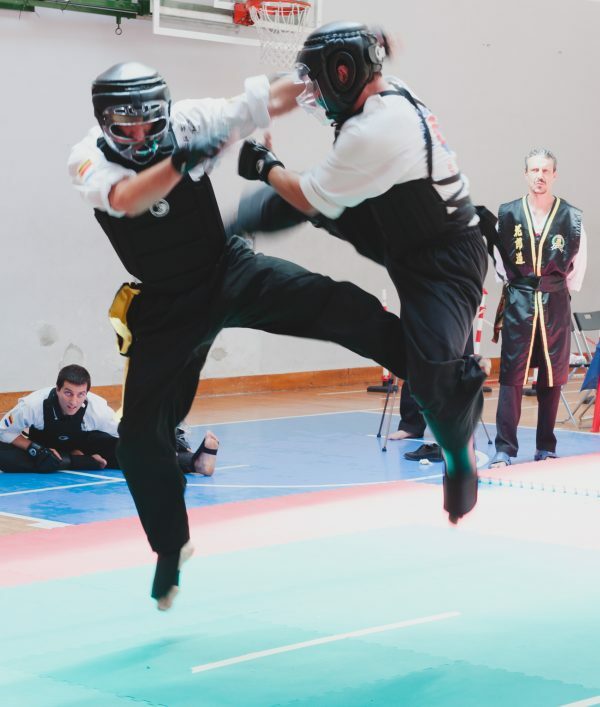 The free sparring and matches exist so that we can practice our techniques in a dynamic expression, learning proper responses to different threats, speed and timing, precision and accuracy, and effective delivery as well as cultivating and maintaining one’s acuteness and spirit. We can accomplish this without having to exercise full-contact where the goal is to injure, incapacitate, render unconscious and prevent the opponent from being able to continue to fight in order to hone our skills. Anyone can be knocked out, and no one is invincible; one proper strike to the right point can render anyone unconscious. In fact, part of the training for full contact is learning how to take a hit and with this training you can receive some blows when you’re prepared, but certainly it does not guarantee that one can take a surprise attack when you’re not ready. The other negative outcome of full-contact fighting for the sake of self-glory, money, and/or entertainment as it relates to the Warrior’s Path is the inflation of the ego and the unstoppable arrogance of invincibility. A warrior’s or for that matter man’s most valuable trait is loyalty. As one continues to win and begin to develop a false sense of pride and self-worth, they grow dangerously self-centered and narcissistic only caring for themselves, forgetting that the true noble path is in service and self-sacrifice. For a warrior it is not how many medals, trophies, or prize money that they have won that matters as no one is undefeatable or invincible, but how many lives that they helped and/or saved. And, in ancient times warriors were taken care of by the Kingdom with land and servants to provide livelihood for the rest of their days. Today, our soldiers fight not for God and are asked to murder and face unimaginable horrors only to return to a minimal pay, no real job, no gratitude, and expected to live sanely with the general population. The popularity and lucre of MMA and many sports alike throughout the world has heightened the always-prevalent dark underbelly of full-contact sports. There are many places around the world where they are having full-contact bouts for children, boys and girls, where the adult spectators make side bets and gamble. The only ones to lose here are the children as though they are animals for fighting like dogs and roosters. Globally, we consider animal fighting to be inhumane and yet we do nothing when it comes to children fighting in full-contact arena. And, of course there are those wicked people, who manipulate, use, and abuse the fighters in impoverished lives for the sake of profit and gambling, much like prostitution. As Martial Artists, we must become vigilant and understand for what true purpose we practice and teach the arts. In Hwa Rang Do we have made a conscious decision not to allow for full-contact fighting. We have deeply contemplated on the idea and we fully believe that it is not in the best interest of our students to have the mind set that they must fight to injure, harm, incapacitate, render unconscious their fellow brothers and sisters in a ring to prove that they are better. We are most interested in creating values and traits within human beings, which promote cooperation and peace rather than competition and violence. Our perception of competition is founded on the idea of cooperation; we strive to better ourselves so that we can challenge and motivate others to become better. Even when we win a match, a tournament, we do not prance, dance, and glorify ourselves in victory, but rather we practice humility and respect for our opponent as we are all brothers and sisters who have struggled in blood, sweat, and tears for the achievement of excellence not only in physical strength, but more importantly in one’s character. We spar and match to learn to control ourselves physically, mentally, emotionally, and in order to overcome our personal fears and limitations as well as maintaining and preserving our skills. Our competitions are based on performance rather than brutal force; it is more about controlling aggression and being more precise and accurate rather than all out show of force and strength. On July 2nd and 3rd of this year 2017 in Genoa, Italy, all the Hwarangdoists and Taesoodoist in the world gather to compete in our annual two-day tournament to share and exchange knowledge, experience as well as to challenge each other to better ourselves and further the development of our beloved Art of Hwa Rang Do. It is more of a family gathering where we immerse ourselves fully for almost ten days of training in seminars, clinics, and Black Sash conferences, which follow immediately after the championships. They compete in many categories as we are a complete martial arts system: Open-hand Forms, Weapon Forms, Light-contact Stand-up Point Fighting, Light to Medium Contact Stand-up Quick Submit Continuous Fighting (Yongtoogi), Grappling (Gotoogi) both positioning and submissions, Weapon Fighting in both Sticks (Bongtoogi) and Swords (Gumtoogi). The aim for a true Mudo, the Way of the Warrior should not be to physically overcome another, but to overcome oneself to become harmonious with others and nature. It is living in peace; not looking for a fight for surely when you do you will find it, but strive to nurture inner peace and become the light where there is darkness, to inspire rather than provoke, to sacrifice rather than enforce. True power comes in ridding oneself of the fear of death and loss, but rather filling oneself with hope, understanding, and in the Truth – that only God can determine our life, the hour of our death, and that all human life is sacred and must be cherished.